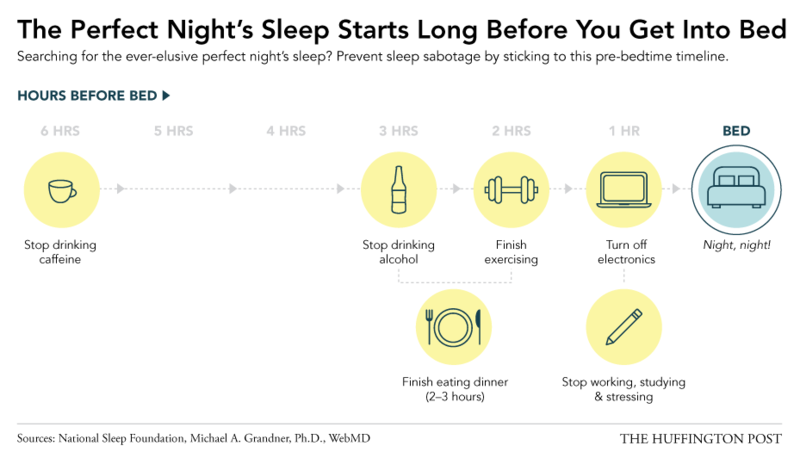 A bedtime routine might sound like something that's only necessary for the grade-school set, but following a nightly schedule can greatly improve the sleep of adults, too. Sleep experts recommend establishing a bedtime routine, both to calm and relax you as you get ready to sleep and so you aren't inadvertently giving yourself jet lag. But following a nightly routine doesn't mean curling up with a good book and mug of warm milk. In some instances, it just means knowing when to cut yourself off from various daytime activities that can interfere with a good night's rest. Here's when to say when. How do you spend the hour before bed? Let us know in the comments below! Follow HuffPost Healthy Living's board Sleep Tight on Pinterest.